For years, trans individuals have lamented Facebook's requirement to be addressed using either male or female pronouns. Starting today, that's all changed. Today, Facebook unveiled a slew of new pronoun and gender options for its profile, a frequently requested feature among transgender users. In addition to being able to select from "male," "female," or "gender-neutral" pronouns, users can now enter their gender as they see fit. "Androgyne," "Pangender," "Bi-gender," "Agender," "Trans Woman," "Transsexual," "Trans* Man," "Cis woman," and dozens of other gender-identifying options are now available to users by selecting the "custom" option in the profile's "Basic Information" section. The new gender identity listing also has a built-in privacy setting, allowing users to determine who is able to view their gender identity when looking at their profile. It's no secret that Facebook has struggled with a pronoun problem. With only male and female options available when it came to pronouns, trans individuals were often forced to label themselves in categories that simply didn't fit. Gendered announcements like "John updated his profile," or "Jane updated her profile" are commonplace, and until now were the only options available — unless someone was willing to jump through a series of technological hoops. "This new feature is a step forward in recognizing transgender people and allows them to tell their authentic story in their own words," GLAAD president Sarah Kate Ellis said in a blog post. "Once again, Facebook is on the forefront of ensuring that the platform is safe and accessible to all of its LGBT users." Former GLAAD vice president of campaigns and programs Allison Palmer added, "Facebook users from across the country have been asking for the ability to reflect their gender accurately, and today Facebook showed they have been listening. Facebook's new gender options will make a difference to many transgender and gender nonconforming users, who are now empowered to accurately describe their own identities on the platform." Palmer worked together with Facebook and GLAAD staff in the development and rollout of these new features. 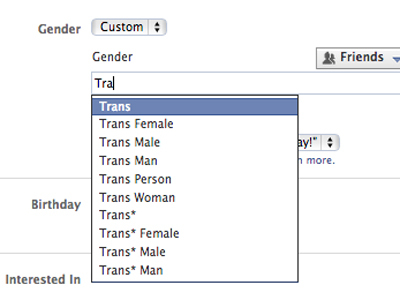 The new custom gender option is available to everyone who uses Facebook in U.S. English.